According to NanoAvionics, on July 5, 2017, a successful on orbit test of the first ever chemical propulsion system running on-board a cubesat was performed. 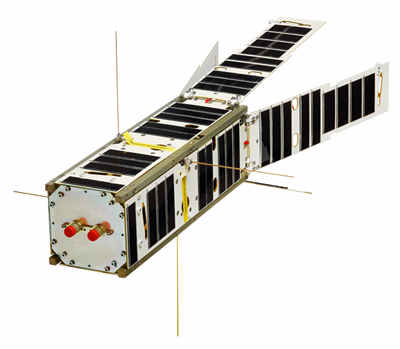 The Enabling Propulsion for Small Satellites (EPSS) system, designed and developed by NanoAvionics, provided the 3U cubesat LituanicaSAT-2 with 10 cm/s of delta-V, making an evident change on the craft's orbit parameters. The cubesat was launched into polar sun-synchronous orbit on June 23, 2017. To test the EPSS, NanoAvionics ran a cold-start program, which is the most complicated in terms of the complexity of the satellite systems involved, followed by a train of pulses with a total duration of 2 seconds, reaching 0.3 g mass of the monopropellant to be used. The average thrust reached was 127 mN, followed by steady peaks of 300 mN, demonstrating that the system works as planned. An orbital change of approximately 200 meters was observed. The telemetry data of the satellite, together with information provided by NORAD, resulted in the successful completion of one of the mission-critical tasks — demonstrating the feasibility of the propulsion system’s use on similar smallsats. The EPSS began development in 2009 along with the QB50 project and, partnering with Vilnius University, has now reached TRL 7. The satellite runs on a non-toxic “green” monopropellant, based on an ammonium dinitramide (ADN) blend that outperforms hydrazine, the most commonly used monopropellant today. With the current performance, the propulsion system has the potential to unlock massive relaunch savings for satellite operators by an estimated 80 percent. This technology will accelerate commercial and scientific space missions, thereby adhering to NanoAvionics’ goal of making space accessible to a wide range of organizations around the globe. NanoAvionics is a smallsat commercial grade platform provider and mission integrator for single missions to constellations. The company's efforts are focused on enabling critical smallsat functions, to optimize their launch, hardware and operation costs and, therefore, to make space affordable to a wide range of organizations worldwide through uncovering new application markets and businesses.